X360 Tiff Image Processing OCX (Team) 1.0 is active x software developed by X360 Software. X360 Tiff Image Processing ActiveX OCX help you to create and maintain multiple Tiff. You can append,delete,insert,move and swap pages within existing Tiff.You can also view and save images to different formats include Bmp,Emf,Gif,Jpeg, Pdf,multipaged Pdf,Png,Tiff,multipaged Tiff,Wmf.Major functions include flip,rotate,resize and zoom the image,fully control the scroll action,draw text and image,get tiff tags and Exif information. This program is shareware, which means you can download and use X360 Tiff Image Processing OCX (Team) 1.0 for free during 30-days trial period. After this period you gonna have to buy X360 Tiff Image Processing OCX (Team) 1.0 software for $269.90 or uninstall the program. 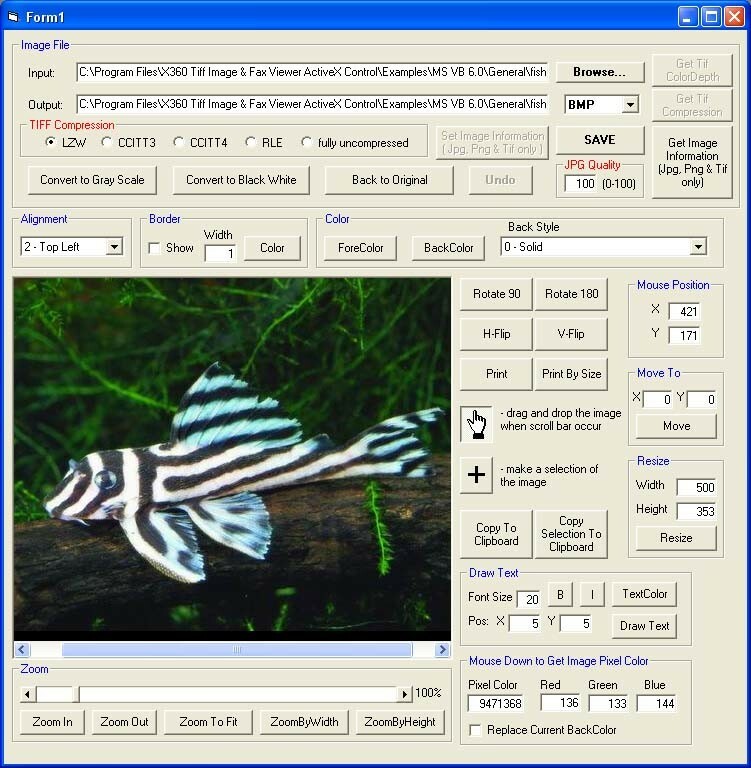 X360 Tiff Image Processing OCX (Team) 1.0 supports English interface languages and works with Windows 98/XP/Vista. Latest X360 Tiff Image Processing OCX (Team) 1.0 does not contain any spyware and/or advertise modules, allowing installing it with no worries concerning valuable information loss. Our website has thoroughly tested development product X360 Tiff Image Processing OCX (Team) 1.0, written the review and uploaded installation file (2616K) to our fast server. Downloading X360 Tiff Image Processing OCX (Team) 1.0 will take minute if you use fast ADSL connection.